Christmas stocking finished! 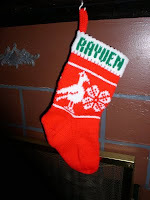 Rayven Rose will have it for her first Christmas. 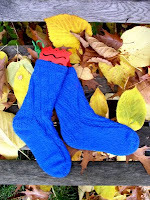 Blue socks finished and delivered. One Christmas vest finished finally! 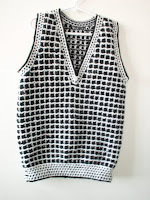 I actually knit the whole vest twice. I had the back finished and the front worked up to the armholes when I ran out of contrast yarn. Started again with a new contrast. 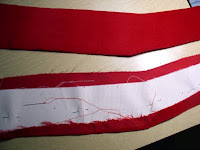 All bands were worked and I went to sew the side seams. The back was shorter than the front. Retreat! All is good now finally. That's one of the problems with using stash yarn, when you run out, there is no possibility of getting more of the same yarn. I have started the second vest for that family. Socks are being knit for the July birthday IOUs. One pair is finished and will be given at Thanksgiving. The other pair has one sock knit. 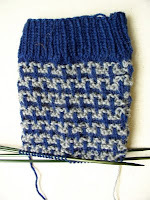 The second pair is a Sock Knitters Anonymous challenge, which means that I need to finish by the end of November. I also need to knit a pair of orange socks by December 6th, for a birthday later that month. 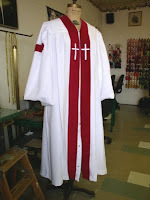 My latest challenge is to create a robe for a minister. Copy the size of he black robe and the colors of the white robe. I learned a lot about robe constructions from this. Luckily the black robe was starting to fall apart, so I could see how the velvet parts were made. The shapes are cut from cotton duck, which is like white denim. Velveteen is hand sewn over the duck form and the appliqued to the robe. You can see the front band in progress. Sleeve bands were made the same way. The sleeves were interesting. On the table is a sleeve from robe fabric. 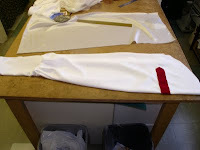 There is lining fabric for the top of the sleeve, with a seam at the elbow. This lets the outer part blouse out. 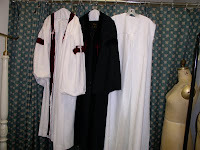 When I pinned it to the robe without the lining piece , it hung to the hem! I used 3/8" white grosgrain ribbon for the crosses. I doubled it to avoid shadowing. The front band is snapped with a fur hook at the top. I needed to apply the snaps before the front band on the left, which covers them. There are front pleats which are longer than my ironing board. I also did not have any way to support the robe while pressing the pleats, so took it to the cleaners for professional handling. I work for these cleaners, so it was done while I waited. 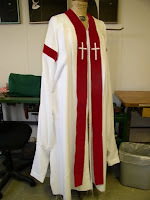 Now I just need for the minister to recover his health and come try on the robe. He was in the hospital the last time I talked to his wife. Every so often, I get a really interesting project in addition to the usual alterations and repairs. 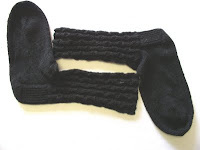 I've just linked here b/c my blog is about to tell a story about a pair of socks that I seem to recall YOU knit for me a dozen years ago. Is my memory anywhere near accurate?